With the 2010 Winter Olympic Games underway, we are reminded of the dedication and focus that is required to achieve our desired goals as individuals and team members and the important role coaching plays in performing at our optimal level. This timely webinar will provide you with key coaching strategies for enhancing your performance to compete in the market in which you work and increase collaboration in your teams to exceed the organization’s goals. In today’s competitive environment, top performers seek ways to continuously improve – coaching helps ensure success. Register now to attend this complimentary webinar! You’ll have the opportunity to: * Understand how coaching plays a vital role in skill and leadership development * Get an in-depth perspective on the key role of leaders in developing talent * Explore the ways individuals can impact the business through collaboration Our speakers: * Roger Mar, US Olympian from the 1992 Barcelona Games and 1996 Atlanta Games and SVP, General Manager, Lee Hecht Harrison * JC Heinen, SVP Leadership Consulting Global Practice Lead, Lee Hecht Harrison Who should join this webinar: * CEOs, COOs, CFOs and Chairmen * Chief Learning Officers and Chief Human Resources Officers * HR professionals * Leadership and organizational development professionals Established in 1974, Lee Hecht Harrison is a global talent management solutions company with over 270 offices worldwide providing expertise in Career Transition, Leadership Consulting and Workforce Solutions. - More than 50% of organizations report the need to maintain positive relationships with their workforce and protect their brand. - Over 80% of firms have reviewed their severance policies in the past 3 years. The “green” sector in the U.S on the rise – from 750,000 jobs in 2006 to 4.2 million by 2038. Job seekers and organizations are looking for long-term job growth and a competitive edge in this growing sector. This timely webinar will better prepare job seekers to market their existing skills for “green” positions. For organizations, this event will provide some key strategies that incorporate the latest “green” tactics to achieve a competitive edge. * Define “green” jobs emerging developments and trends. * Gain insight into the resources, tools and training needed to get started in a “green” career, including the power of green social networking and “ecopreneuring”. * Examine the benefits and impacts from an organizational perspective of developing green jobs. * Dr. Grady Batchelor, President of the State of Alabama, Winston County Industrial Development Authority. With over 270 offices worldwide, Lee Hecht Harrison is the global talent development leader in connecting people to jobs through innovative career transition services and helping individuals improve performance through career and leadership development. Tightening the belt on your human capital in today's slowed economy. Return on investment and career transition services in today's real HR world. As increasing numbers of companies are reducing staff, some of the urgent questions for HR planners and management are: What kind of severance and separation package should we offer? Are there any recent trends that are impacting my industry? Who in the organization is entitled to severance and how much? Analyzing and addressing these questions can be complicated and time-consuming. With the slightest error, firms can create potential liability in attracting and retaining top talent now and in the future, as well as hurt their standing as an employer of choice. 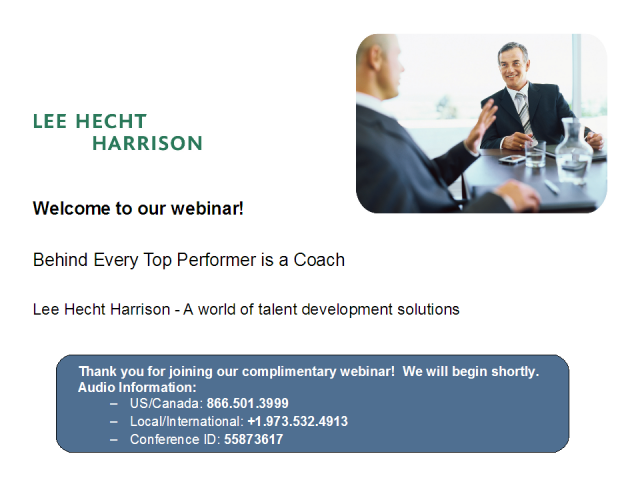 Join Rob Saam, Career Transition Practice Lead for Lee Hecht Harrison, the world's leading talent management solutions provider, and Richard Greenberg, a leading employment attorney from Jackson Lewis, as they share their insights on: * The average amount of severance pay. * Norms for outplacement services for various levels of employees. * Why more companies are redeploying employees slated for reduction. * How major employers perceive separation benefits in the context of their reputations as employers of choice. * The effect of severance and separation packages on legal risk. Who should join this webinar: * CEO, COO, CFO and Chairman * HR and diversity officers and professionals * In-house legal counsel Register now and join us for this informative web presentation. Established in 1974, Lee Hecht Harrison is a global talent management solutions company with over 240 offices worldwide providing expertise in Career Transition, Leadership Consulting and Workforce Solutions. The global economic downturn is creating questions for many organizations regarding their approach to leadership development: • Given the tough economic times, should an organization continue to develop its leaders, or wait for a financial rebound? • Are leadership development investments appropriate in these times of limited discretionary spending? • And, if development does continue, which leaders should be included in ongoing development? Whether your firm is currently thinking about or is already investing in leadership development initiatives, this event will provide you with some valuable insights in your decision-making progress. Join our diverse and experienced speaking panel to explore why leadership development programs are mission critical at this time. When you register to attend this complimentary webinar, you’ll have the opportunity to: • Understand how the current economic environment affects leaders and the workforce. • Examine best practices for aligning your firm’s leadership program with its organizational and business strategies. • Explore the key components of an effective development program to develop leaders at all levels Featured speakers: • Maryanne Spatola, Vice President of Leadership and Professional Development, Selective Insurance • John L. Bennett, Ph.D., PCC, Senior Vice President, Talent Solutions Director, Lee Hecht Harrison Who should join this webinar: • CEO, COO, CFO and Chairman • Chief Learning Officers and Chief Human Resources Officers • HR professionals • Leadership and organizational development professionals Register now and join us for this informative web presentation. Established in 1974, Lee Hecht Harrison is a global talent management solutions company with over 240 offices worldwide providing expertise in Career Transition, Leadership Consulting and Workforce Solutions. How social networking and your “e-reputation” affects your career in a Web 2.0 world. Lee Hecht Harrison is part of Adecco Group, the world leader in workforce solutions with over 6,000 offices in over 70 countries and territories around the world.